June 3-4, 2014. She gave birth to 8 beautiful, healthy pups. There are 5 boys and 3 girls. 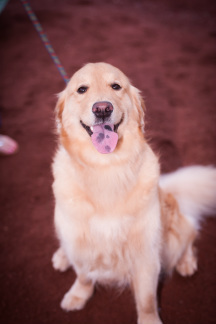 Luna is a 3 year old AKC Golden Retriever from championship lineage. She is the daughter of Chloe and Casper and currently lives in Kentucky with Sandy's daughter. This Southern Belle enjoys going to the Farmer's Market, watching Dogs 101, going on walks, playing with her stuffed animals ("Babies"), and cuddling. She rarely barks and loves to give hugs. Luna has a very light coat with white feathering. She is tall and lean with sparkling chocolate round eyes. She weighs 74 lbs. Luna is a "Road Warrior", as she regularly drives the 15 hour ride from Kentucky to Connecticut without any issues. She loves people and giving love. She will be delivering her puppies here at our homestead in Connecticut in the Spring of 2014. "We are so proud of our Hankie Boy! 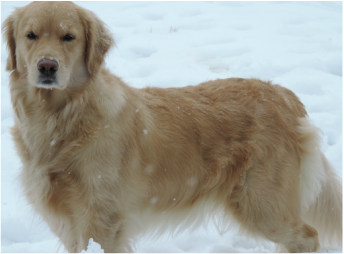 Hank came to us in Feb of 2011 from Pathfinder Goldens, and is a well-balanced boy with several CH goldens in his pedigree, mainly from Laurel Goldens. We couldn't ask for a more interesting and fun-loving golden boy. 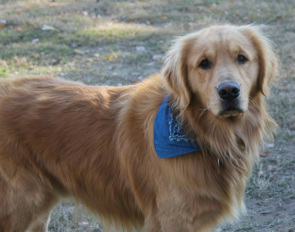 He is a little more independant minded then most goldens, but is very intelligent, sweet and outgoing and makes friends where ever he goes. He is also the most vocal of our dogs, and loves to "talk" to you to let you know just how he feels about getting his dinner on time, among other things! He is also one who loves, loves to swim, and most days, you cannot get him out of the pond~there is always the lure of catching fish....maybe even a squirrel or two! Before the age of two, he had already earned his CGC, BN, and only needs one more leg for his RN titles. He has a great natural knack for tracking, and we hope to pass his TD (tracking) test in 2013. Hank is OFA eye and heart certified; PennHip cleared (Excellent) w/OFA hip clearance of Good. Normal/Clear for prcd-PRA (OptiGen). **Update: Hank and I earned his first CD leg on 6/7/13 and finished his first Rally title, too! Way to go, boy!"